Datanator, an innovative new cross-platform, multi-device mobile syncing solution from Lollaksi, launches today. Available for Android, Apple and BlackBerry devices, Datanator is a cloud-based mobile data syncing solution for consumers that not only syncs documents, video and images but also contacts, SMS and calendar tasks and events. A new service called Datanator has been launched to enable smartphone users synchronise their data across various smartphone and tablet devices. Available for Android, Apple and BlackBerry devices, Datanator is the first cross-platform cloud-based mobile data syncing solution available to consumers. The personal cloud service enables consumers to back up, manage and synchronise all the valuable content held on their mobile devices. The Datanator apps and web platform have been created by Lollaksi, an innovative provider of mobile solutions and services. Easy to install on smartphone and tablet devices, Datanator synchronises and manages mobile data between Android, iOS and BlackBerry operating systems, providing users with access to a central cloud in which their data is stored. Currently the only solution of its kind on the market and offering unrivalled features, Datanator works seamlessly across operating systems to give users the freedom and flexibility they need when using different devices. Designed for anyone concerned about data synchronisation, protection and back up, Datanator allows users to transfer their data between devices and feel confident that it is always securely backed up to the cloud using industry-standard security protocols. Access and control is managed online via a secure web-based content management platform, so that consumers can effortlessly organise, backup and manage their data. Users can access and sync all their mobile content, including photos, videos, contacts, documents, calendars and more from any device, with synchronisation a one-touch task. “With the proliferation of mobile devices, many consumers don’t want to be restricted to a single operating system but keeping data synced and backed up across multiple operating systems has, until now, been a time-consuming and imperfect experience,” Moon added. With seamless integration into any mobile operating system, Datanator gives users secure access to their personal data whenever and wherever they need it, irrespective of the device and operating system. It frees them from the onerous task of manually transferring data between devices, whilst the automatic back up removes the fear of losing data when a phone is lost or stolen or when upgrading to a new device. It also means they are not tied into a single operating system because data can be shared across different platforms. 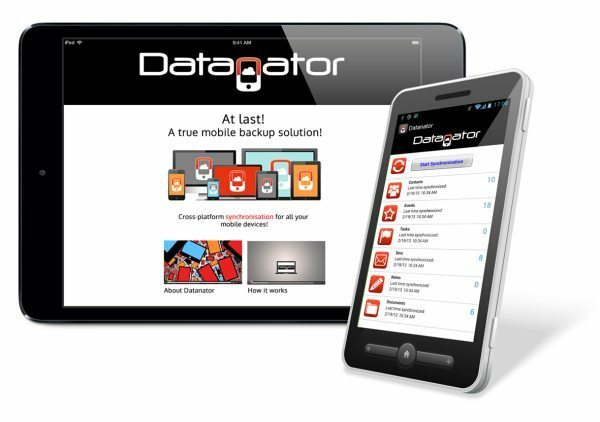 Datanator’s web platform and apps are free to download, and users can purchase a storage package to suit their requirements, paying monthly or annually. Datanator is available with a month’s free trial until 13th January 2014, with various storage and payment options to suit requirements. With one price for one account, there is no extra charge for additional devices. Users can choose how to divide their storage space and back-up their Contacts, Calendars, Tasks and Events, Notes, SMS, Photos, Videos and Documents. Is the Datanator app something you would use? For more information and the option to install this free app, please click on the relevant link to your platform – iOS / Android / BlackBerry.